I have been a collector of classic cars for 35 years. 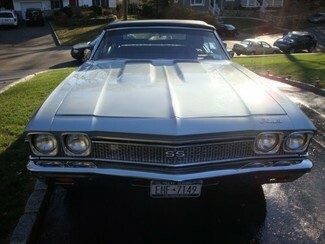 This 1968 SS 396 Tribute is one of the cars from my collection. See more at www.gccc.us This 1968 SS convertible with factory a/c was previously owned by a race car engine rebuilder who completely rebuilt this engine to where it pumps out an amazing 609hp! Wow, when this car is started you'll think you're at the drag strip. The exhaust system is perfect for this car and the sound really complements the power of this engine. ~~ADDITIONAL EQUIPMENT ?? ?A/C ?? ?Rolling Tach ?? ?Power Brakes ?? ?Power Steering The 1968 Chevelle got an all-new distinctly sculpted body with tapered front fenders and a rounded beltline. The car adopted a long-hood/short-deck profile with a high rear-quarter "kick-up". While all 1967 Chevelle models rode a 115-inch (2,900 mm) wheelbase, the 1968 coupes and convertibles now rode a sporty 112-inch (2,800 mm) wheelbase. The Super Sport (SS 396 coupe and convertible) became a series on its own. THis car is a fine Tribute to the SS396 convertible for a lot less money.